Southern Illinois University Edwardsville undergraduate and graduate students represented the Schools of Education, Health and Human Behavior (SEHHB), and Pharmacy (SOP) on a national stage, earning top prizes for their research activities. 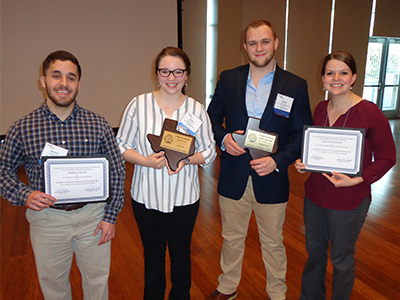 Five students were invited to present their scholarly work during the annual meeting of the Texas chapter of the American College of Sports Medicine (TACSM) held Feb. 16-17 at Baylor University in Waco. Three of the students are participating in the University’s Undergraduate Research and Creative Activities (URCA) program under the faculty mentorship of Joshua Wooten, PhD, and Brianne Guildford, PhD, both assistant professors in the SEHHB’s Department of Applied Health. The students are Girard native Dakota Kamm, and Marcus Breden, of Hardin, along with Claire Maciejewski, of Carbondale. Two graduate students and research assistants in the Department of Applied Health, Megan Schaller, of Ferris, and Matt Harris, of Germantown, Md., also presented their research in the master’s judged category. According to Wooten, the group’s achievements are supported by a multi-disciplinary partnership between the SIUE SEHHB and SOP. Photo: (L-R) SIUE students Matthew Harris, Megan Schaller, Dakota Kamm and Claire Maciejewski presented their research at the 2017 annual meeting of the Texas chapter of the American College of Sports Medicine (TACSM).